← Big News ……more Big Ron & Holly… (Grin Up North)….. The Famous Grouse meets Diamante Dog……………..
………..and is not impressed ! Reproduced here with the Kind Permission of J & L. Mitchell. Part of a larger painting, coming soon. 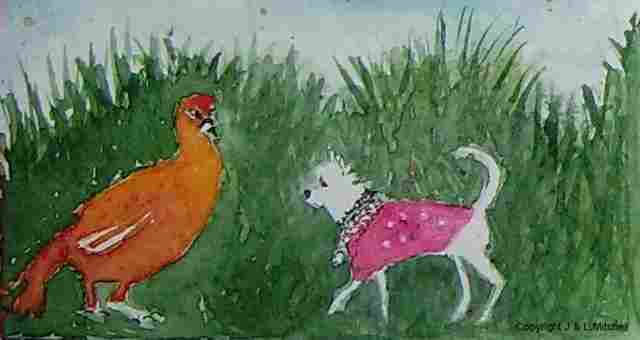 This entry was posted in Sheffield - watercolours and tagged chihuaha, Diamante Dog, Famous Grouse, Ferdinando, Mitchells Wine Sheffield, whisky. Bookmark the permalink.